I am a data nerd, striving to be the Nate Silver of United Methodism, so I absolutely appreciate fellow data nerds who do the work. For this reason, I’ve read Len Wilson’s blog for years, and I pay close attention to the posts that deal with numbers and the church. We’ve both been on the same data trail at times, sniffing out the relationship between membership and attendance (here’s mine) among the Annual Conferences in The United Methodist Church. I appreciate his work even if I disagree with his analysis at times. 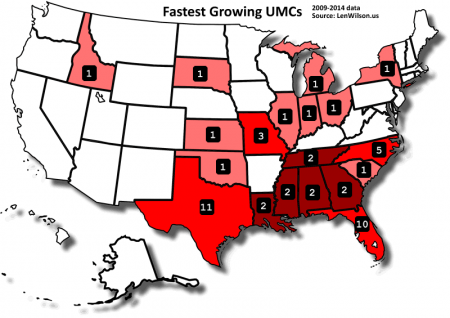 Earlier this year, Len released the latest update to his long-running series of the “Top 25 Fastest Growing United Methodist Churches.” Here’s 2016, 2015, and 2011 lists. It got enough pull on social media and my friends’ shares that I felt it merited further critical reflection. Len is very self-critical and reflective about his analysis, which I appreciate. Nonetheless, I’ve identified three problems with these lists that I think bear reflection by other data nerds. #1 – Relevancy Beyond the Bible Belt? In the 75 potential slots across 3 lists over 5 years of data, Len has only named 51 churches (PDF of analysis) as some have been on 2-3 lists! That’s tremendous growth for those churches and it reveals that growth is self-perpetuating: once you are growing and you adapt well, you will keep growing. With 86% of the churches that are fastest-growing coming from the South, the problem then becomes what can churches that are NOT in Bible Belt culture learn from these churches? Yes, we can learn worship styles or assimilation techniques or preaching bullet points, and I hope we do. But we do not learn how to connect with secular cultures outside the Bible Belt. And that’s a problem for a missional church that is looking to grow beyond the Bible Belt, and doesn’t seem to offer help to those areas of the country (like mine) where secularism is growing the fastest. #2 – Witness to or Reflection of Culture? I’m curious if you would be able to quantify the fastest-growing churches that do not reflect the culture around them? The outliers who are growing (even at a moderate rate) who do so despite a mismatch with the culture around them? For example, evangelical churches growing in Texas is a reflection of the culture around them. Glide Memorial (not on the list) growing in San Francisco is a reflection of the culture around them. That’s what I mean by matching the church with the culture–little wonder the best ones are growing! I’d like to know who are the scrappy outliers who are growing in spite of not being a match. I think it’s still a valuable question. As we see from their location, the churches that are growing are overwhelmingly conservative evangelical and are overwhelmingly located in conservative areas of the country. The churches, I would assume, reflect the culture around them more than they don’t. That doesn’t mean they don’t rally against some parts of culture (gambling, poverty, etc), but that demographically they agree on far more than they don’t. I think this is important because I’ve served churches that were a good pair with their culture, and churches that were the loyal opposition to the culture around them. As secularism spreads across the country, we would be wise to lift up those who are thriving in opposition to culture, not growing hand-in-hand with it. Context matters. Two of these are actually in economically challenged areas. God bless them. The rest are in affluent areas. Hope they pay their apportionments in full. All are in areas where the fastest growing demographic (Hispanic) is largely absent. What this table tells me is that as a culture, the UMC invests most and grows most in areas outside the fastest growing demographic (Hispanic). You can look at your own ZIP code info here–for full disclosure, here’s my church’s ZIP code. John has an excellent point, and one I suspect is shared among most of the 51 churches: they are in affluent pockets of the country. Whether or not they draw their congregation from that zip code is less important than the fact that they are in areas with a lot of money and a lot of white people which means more resources. While these churches are surely racially diverse as they draw from beyond their ZIP code, the list doesn’t help the rest of us who are not in the same shared demographic of incredible resources. Year after year, these type of lists come up and I shake my head–not because they are wrong, but because they are irrelevant to me and others outside of rich white conservative areas of the Bible Belt. We can learn some things from these churches, surely, but the cultural disconnection and the lack of the same resources yield more discouragement than encouragement. Since I moved from the Bible Belt to the None Zone, I’ve asked the question: what is The United Methodist Church doing to deal with the creeping secularism outside of the Bible Belt? We seem to not do well about drawing out authors from the secular north and west (1, 2), we are considering removing the West as a distinct region entirely (1), and we assume nothing good can come from it (1). My hope is that other churches look at these lists and learn some technical changes from these thriving churches. But my hope is also that the data nerds expand our footprint and start drawing out the scrappy outliers who are living out truly adaptive change to creeping secularism. Only by empowering those adaptive churches now will we have a chance when secularism washes fully against Bible Belt doorsteps. I agree conext is SO important! My little church in rural NONE Zone won’t ever make the statistical lists, but the fact that our average worshipping attendance has increased by 8-10 people every year since I’ve been here (since 2010) is huge for a community where there is only 26,000 people and only 23% attend churches. Granted, I merged two churches (so technically I closed two and started another), but still have grown. Context matters. The same goes for me, Laura. I’m thankful for the writers and bloggers who address the issue of “growth” in the small church / rural area. My two congregations here in NE New Mexico do not reflect the demographics of our area, yet we continue to show numerical growth, one or two families per year. We prefer to measure growth by how effective we are at loving God and neighbor, not necessarily how many we have in attendance. Contextually, we are adapting through service to our communities. You comment: “I hope they’re paying apportionments.” I’m curious. Do you have stats on that for these growing churches? Hi Kip, that’s a quote from someone else. But to your question, you can find that out from Annual Conference journals or possibly from the new UMC Data website. I’m really thankful for this post! I guess I, too, am a data nerd, though I never thought to call myself that. I typically fall down the rabbit hole of clergy numbers, age ranges, number of elders/deacons, etc. In the interest of understanding you more fully, could you give me your working definition of ‘secularism’ or ‘secular culture’? I believe you bring up some great points that are not only truth-in-love, but should speak to us about the future of the Church and UMC in America. I represent leadership in one of those south eastern jurisdiction conferences. agree with all of the points that have been raised: all are valid, all are good, all are worthy of study. I thought I would share with you an additional level of analysis we do, something we learned from Lovett Weems, that helps us study, learn, and grow. We identify, 1) churches growing in areas with growing demographics, 2) churches growing in areas of declining demographics, 3) churches declining in growing areas and, 4) churches declining in declining areas. (We look at numbers and not necessarily social compatability). We celebrate with churches in quadrant 1. We study and learn from churches in quadrant 2. We work alongside churches in quadrant 3. We pastor, in a hospice kind of way, with those in quadrant 4. This kind of analysis is not difficult but extremely helpful in terms of appointment making and leveraging support and resources. Thanks for your ministry. Always a good read. Thanks for your reflections, Mike! I am interested in the way you compile the data. Though I am not in your area, I wonder if I could glean some helpful insights into my own church. Is this data available anywhere? A great book! My class read a draft of it for our Evangelism class before he published it. You raise some great points in this post. There are even more factors of course, and then also the questions about if a list of fasting growing (numerically) churches even really matters. I guess it matters in some regards, but much less than our egos want it to matter! I remember Francis Chan once saying something to the effect that he was haunted by the fact that if Jesus opened a church down the road from his, his church would be bigger and more popular…. Damning stuff indeed, as growth and size are not necessarily related to faithfulness of ministry. Also, I think that a geographic area of growth is very key no matter the region. I think the Bible Belt is dead in many ways, and I think you would find many parts of the South to be less churchy or church friendly or caring about the church than you might expect. I think the explosive growth in population in Texas, here, has a major role though, much more than it being a Bible Belt thing. But, I will say how much of this growth of these very large churches is sheep movement to a bigger ‘better’ church, than any real new disciples being made? I don’t always know, but there is much more to it, and I do greatly appreciate your perspective on this. Grateful for churches of all shapes and sizes. With different passions and gifting. Lord, keep us from becoming self-righteous and thinking our way is better than those listed and vice versa. Nothing is worse in your eyes. And . . . maybe that rancor free response from Rev. Weber explains those rankings more than geography, secularity, and ethnicity. Thanks for your comment, Adam and Talbot. It’s good to have the lead pastors of these Top 51 churches in this conversation. I think it is empowering to all churches to both see your success and be inspired by it, but also to those who are not inspired to give more context as to why. I am sorry, but I don’t understand. The article you talk about was looking at the Top 25 Growing UMCs. The stats for that article were just this…the ones that were growing the fastest based on worship attendance. We can make all kinds of lists…if you don’t like this list, make up another list. Even the author of the list admits that he is only looking at churches that worship 1,000 or more. If anything, that is my biggest beef with the list. There are many church that are under 1,000 in worship attendance that have seen great growth…and we can learn from that. If churches with under 1,000 in attendance had been included then churches outside the “Bible Belt” would have been recognized I am sure. So even the author is admitting, in a round about way, that only a small sampling of the country is being considered. One thing we have to remember is that for the last 40+ years we have been talking about how the UMC is dying. Every Annual Conference, General Conference, Leadership Training, and on and on and one talks about how we are dying. So the opposite of this is to look at those churches that are not dying. To be honest…I think we need to celebrate growth where ever we can get it. After all, if even one comes to know Christ or grow in faith or finds help in their journey…shouldn’t we celebrate? The reality is that all churches are compared, either directly or indirectly, to the successes of the largest churches in their regions. “Why aren’t you doing this?” My church is the largest in our state, and we didn’t make the list of course, but people make references to us all the time in comparison. It’s troubling but the reality. So the reality is that there’s ministry and missions to be celebrated at all these 51 churches, I’m sure of it. But when we make these lists and outline why they are so awesome, it helps to be honest with what else they have in common…which is what I did above to help frame the inevitable comparisons that will come. I am pastor of 2 small churches (defined as <200 in attendance). Small churches, as well as middle, large, and mega, should be vital in their worship, outreach, and mission. Since the vast majority of churches in the UMC are small, they are not served by comparisons to large and mega churches. We often are located in urban areas and small town and rural settings. People in these areas need the Good News also. Oh, and by the way, one of the churches I serve saw their average worship attendance grow 17% from 2014 to 2015; from 58 to 68. This near a town of 300 and a zip code population of 1,700. Small churches are vital to the UMC. Thanks, Jeremy, for all you do in commenting on UMC concerns. Better title: “My Three Problems with Top 25 List.” The /article/list is not disingenuous in any way–the author establishes his criteria and reports accordingly. As a statistician, he’s done his work properly. That being said, I believe a lot of UMs would enjoy seeing the list of the 25 ‘growingest’ churches…regardless of AWA. There would be much to learn there I imagine. However, your article does raise interesting and important questions, and I appreciate your questions. Thank you for calling our attention to this points for consideration. Thanks Jon. I don’t think I implied any disingenuousness. Nor do I think I need to add “My” to a personal blog. My purpose was to give context to what three qualities the Top 51 had that maybe the churches who wouldn’t make the list didn’t–and why that matters. I agree….with Jon. We need someone (a stat nerd!) to look at the top 50 to 100 “fastest” growing church based on worship service numbers, regardless of size. I work in a church of just under 6,000 members and some great ideas have come from church much smaller than us. Especially when it comes to reaching out to immediate community needs! So…who will do that list? Always intrigued by your thoughts and in depth analysis, Jeremy. Thanks for doing some of the heavy lifting. I love sharing your ideas in conversation within my local church. I wish we had stable pastor tenures. In the three UMC churches I had attended semi-regularly for the last twenty years, I don’t think I’ve had the pleasure of really engaging with my pastors. The average tenure is around three years, so I think the congregation isn’t really getting enough time to connect with our pastors. I think itinerancy has overstayed its welcome. We no longer have circuit riders. I think we should move to a more congregational or presbyterian polity. Jeremy, I especially appreciated your #3 The Problem of Wealth and Whiteness. I would love to see more sophistication in the statistics to highlight which churches are growing more diverse ethnically. What we see here are static numbers. How do they compare to local/regional demographics? If they are moving from monochromatic to polychromatic, how are they doing it? That is a signal of real health and those are the congregations I’d like to see lifted up as success stories regardless of size. Hi Talbot. You’ll note I wrote above that the emphasis is on the area the church is in, NOT the church membership itself. In fact, your church ZIP code with a median income of $56k and only 58% Caucasian hardly falls into the same category of concern of many of the Top 10. Thanks for serving a diverse area that more of us can relate to. I am Jack Stephenson, Senior Pastor of Anona UMC, one of the churches on the top 25 list multiple times. I would like to say yes we do pay 100% of our apportionments. We are not conservative nor do we match Bible Belt mentality. We evangelize pockets of poverty and start new sites and services not based on wealth but need and staff to meet the demographic. . We are in a no growth demographic. We are over 140 years old as a congregation and consider adaptation a way of life. Good to have you stop by, Jack, and keep up the good work. Thanks for helping us see that the numbers do not tell the whole story. Blessings. I stumbled upon this article through a liberal friend who shared on Facebook. In reading the article itself as well as the subsequent comments, I am thinking that many concerns in analyzing church growth within the Methodist denomination that are misdirected especially in the size of congregations. There needs to be more emphasis on the preaching, listening and adhering to biblical truth. It starts with the pastor and the qualifications. I see nothing but talk about being “relevant” to current culture. Our country’s society has been in major moral decline as each decade passes to the point that sinful lifestyles have not only become “tolerant”, but lauded. We are in a time of the vanishing conscience whereas good in a biblical sense is now seen as evil and visa versa. Many mainline church denominations including Methodists as a result are abandoning and compromising the truth of the Word of God, the Bible and catering to the sinfulness of this world and actually embracing the sinful standards of this world. While it would be agreed that we need to reach people at their level, we as a church are not given a license to compromise on this sacred truth. Sadly, the larger the churches, quite often it draws people to the masses, not because the sinful souls seek the truth to be saved in the true pure gospel, but just want to be sensualized by worldly music often disguised as contemporary Christian music and want their own ears tickled by shallow sermons justifying their sinful hearts and lifestyles instead of the truth of the Bible. People don’t want to be convicted of their sins and repent to true saving gospel. All this I feel is the reason of the decline of society’s involvement in the organized church. As much as we complain about comparing church size, the number of members and average worship attendance is easy to calculate. I would like to throw out to the group the following: What other areas would you like to track in terms of “outstanding” performance. What would be helpful for your demographic? And how might we track that. I can think of a number of items right away – % of people involved in a ministry; # of people the church has ministered to’ relation of church growth to area growth (i.e. 10% church growth while the area has decreased 10%) and so forth. Calling all data nerds – what say you? What other presentations of data would be helpful? NPR Guest accused the United Methodists of…flockstealing? ?